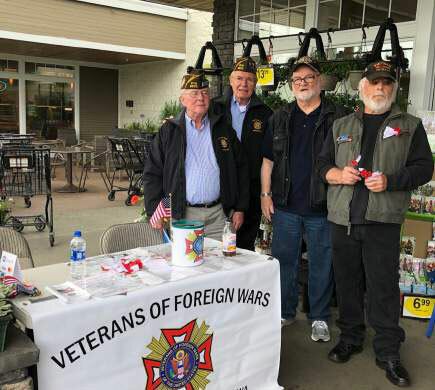 On Friday and Saturday May 25 and 26, thirty of our VFW Post 8870 comrades distributed Buddy Poppies at four location, which included our usual presence at the QFC at Westgate in Edmonds, QFC at Mukilteo Speedway and the Fred Meyer at 164th and Alderwood Mall Blvd. We added a new location, the QFC at 196th and 76th Ave West in lieu of Central Market in Mill Creek. Thanks to the dedicated effort of so many, we collected over $14,000 for our relief fund, which will allow us to continue our numerous efforts on the part of veterans in need and the community around us. If I may revert to my sailor persona and use a Naval term, “Bravo Zulu” to all hands. Left to right, Commander Mike Denton, Quartermaster Dennis Peterson, Mike Reagan and Bob Little staff one of two doors at the Mukilteo Speedway QFC. 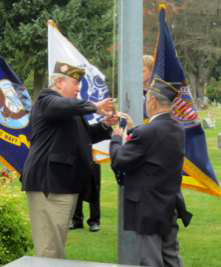 Other uses may include more exposed venues for Poppy distribution, the Edmonds Farmers Market and other events. 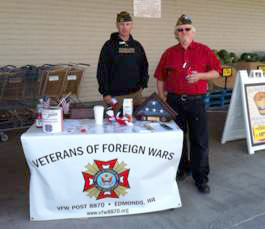 This photo is from the VFW Store catalog; we have yet to set it up for the first time. 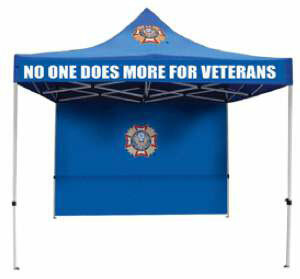 If you have ideas on local events at which we can make use of this canopy, give your Commander a shout. One of the most important days of the year both from a fund raising standpoint and recognition of our fallen comrades, is Memorial Day. 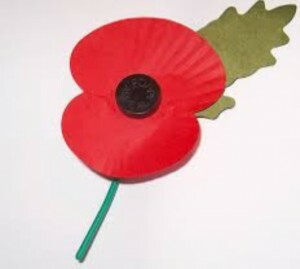 A time to remember all of our fallen brothers sisters of all wars. If you have yet to sign up to help with poppy distribution, please do so at the April Post meeting, or by email to Bob Crawford or Commander Denton. We have four locations to staff: QFC Westgate in Edmonds, QFC Speedway in Mukilteo, Fred Meyer in North Lynnwood and Central Market in Miil Creek. This year all locations will operate on Friday and Saturday of Memorial Day weekend. 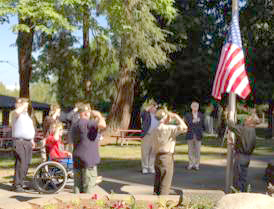 On Memorial Day itself, Monday, May 28, we will gather at Edmonds Memorial Cemetery for our usual Flag ceremony and at which time we will especially honor our fallen from the recent conflicts in the Persian Gulf region and all who have died in post 9/11 service. Post 8870 Members: Prepare for Action May – July! 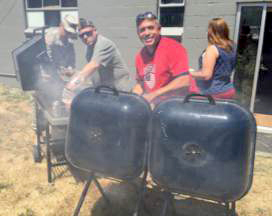 May, June and July are busy months for our Post, with Poppy distribution and other Memorial Day observances in May, Flag Day in June and, of course Independence Day, when we participate in the Edmonds Kind of Fourth parade and hold our annual VFW/AL barbecue/picnic. (Followed of course by fireworks int he evening. month and make a commitment to help at one of our locations on one or both days. Friday, May 28 or Sat, May 29.
support our Veterans Plaza and information on how families can honor individual veterans through the plaza.